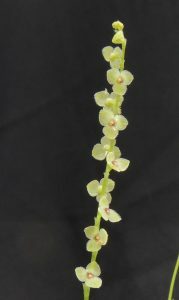 I mentioned yesterday that our first contact with stelis species was in Brazil and this is one of the species found in the Mata Atlantica around our base in Macae de Cima. 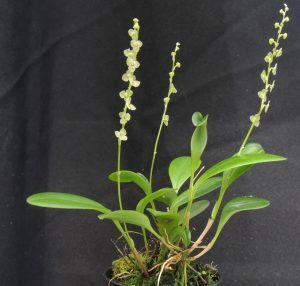 Unlike yesterdays Stelis reginae, which is large growing with 15cm leaves and 5mm flowers, Stelis itatiayae is a real miniature with 4cm leaves but impressive erect flower spikes and relatively large hairy and attractive flowers. The species is found in wet forest from 900-1400m in the low trunk area so enjoys good humidity and we find it loves a 3cm mossy pot.